With Game 4 in Philadelphia, what looked to be around a thousand or more Caps fans made their way to Verizon Center Wednesday to watch the game on the big screen. 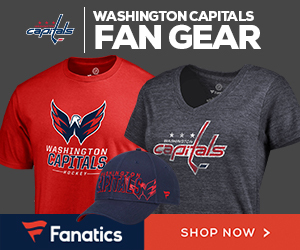 Grant Paulsen and Danny Rouhier from 106.7 The Fan, along with Caps Erin – the Caps’ in-game host – gave lucky raffle winners some cool gifts, including autographed sticks and jerseys. Wes Johnson called the goals and penalties while Jarrod Wronski played the tunes. Despite the loss, Caps fans did make this a very fun experience. Grant and Danny from 106.7 The Fan. A three-week old baby enjoys the Caps viewing party. The Red Rockers give away the team poster and other fun stuff. The Beard from section 403. Erin calls out raffle numbers. Plenty of fans show up.